One of the best ways to sneak vegetables into a sweet and delicious treat is to make zucchini bread! The zucchini is hidden throughout the batter and the flavor of cinnamon and ginger overpower any hint of a vegetable presence. Zucchini bread out of the oven that is super moist and delicious! I fell in love with zucchini bread as a child when my parents would bring in mountains of zucchini from the garden. Back then I refused to eat any green vegetable but I would eat several slices of my mom’s homemade zucchini bread without hesitation. Of course she was smart and didn’t tell me it was made with zucchini. She referred to it as cinnamon bread, and I fell for it! One hint to hiding the zucchini, be sure to peel it before shredding. That way there will be no speaks of the green skin peaking through the loaf. Otherwise, shred it with the skins left on. You can shred it using a box grater, however, I prefer to make life easy and use my Hamilton Beach Food Processor to shred it in seconds! 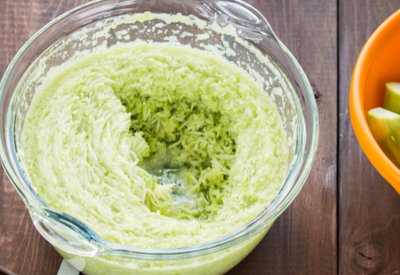 Shredding zucchini is simple and easy using a food processor. The best thing about this zucchini bread recipe is that the loaves come out super moist. It is so frustrating to take a bite of bread only to have the entire piece crumble apart. That is not a worry with this recipe! The combination of oil, white sugar and brown sugar provides the perfect moisture level to hold it together as you sink your teeth into the soft bread. And the combination of cinnamon and ginger gives the bread that WOW factor that keeps you coming back for more! 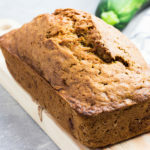 Moist and delicious zucchini bread using fresh, shredded zucchini seasoned with cinnamon and ginger. In a mixing bowl (using a paddle attachment if applicable), combine white sugar and oil – mix until creamy. Add brown sugar, eggs, & vanilla. Mix until combined. Slowly add the dry mixture into the wet mixture and mix until combined. Mixture will be thick. Grate the zucchini and fold it into the batter. As the zucchini becomes incorporated the batter will become thinner. Bake for 45-60 minutes or until you insert a toothpick in the center and it comes out clean. Let sit for 5 minutes in the pan before transferring to a cooling rack. ← Corn Dog Recipe – Even Better Than At The State Fair! Please indicate size of loaf pan….9X5? 8X4? Hi Linda You can use either size loaf pan. The 9×5 may be done a little quicker than the 8×4 but they both work well. Is there a substitute or a way to cut back on the oil used in the recipe? Can you cut back on the sugar? I have made a dozen loaves with this recipe and it’s great but I’d love it to be a bit healthier. Hi Sharon I often substitute apple sauce for oil in a lot of recipes to make them healthier. And you could cut down the sugar too or use a sugar substitute. Thinking healthy is always a good thing! I made 3 batches from this recipe today. I did sub 1/3 cup of applesauce for part of the oil and added a couple of handfuls of ground flax seed. In the first batch I put 1/2 cup of the flour in a quart sized bag, added some dark chocolate chips, shook the chips up in the flour and blended in the contents of the bag just before adding the mixture to the loaf pans. I repeated this in the second batch with fresh blueberries from our bushes. In the third batch I repeated with pieces of dried apple and chopped walnuts and extra cinnamon and nutmeg. Each batch was amazing. Thank you for sharing your recipes. Wow, those all sound amazing and delicious! 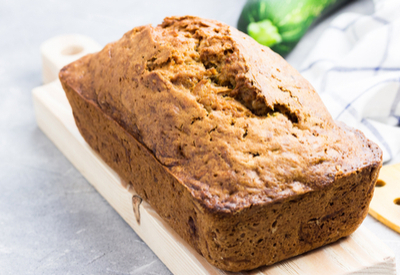 Thank you for sharing how you can make this zucchini bread recipe customized!